Work shoes are available in many shapes and have unique features and materials designed for specific occupations and uses. 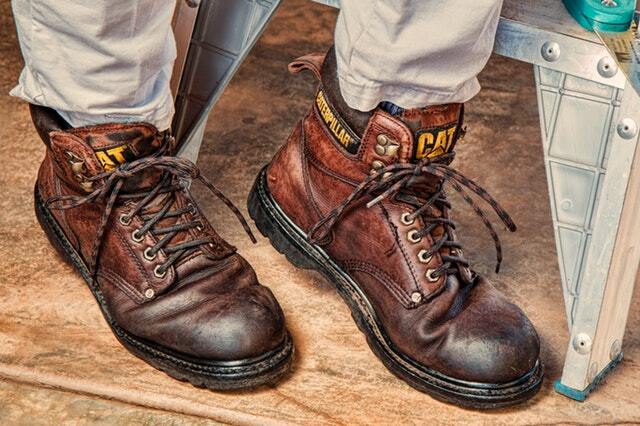 Thick leather boots with steel toe boxes can protect your feet. Boots with varying degrees of traction also are available. Work shoes can be very tough on your feet. Most work shoes offer limited support and ventilation. We see many people who wear work boots with heel pain, athlete's foot, and nail fungus. There are many ways to help offset these problems. If you are experiencing pain, you should definitely see a doctor. Your doctor may recommend custom inserts to stabilize and support the feet. In addition, you should use an antiperspirant to prevent excessive sweating which leads to athletes foot. It is advised to change your socks throughout the day to keep your feet dry and clean.